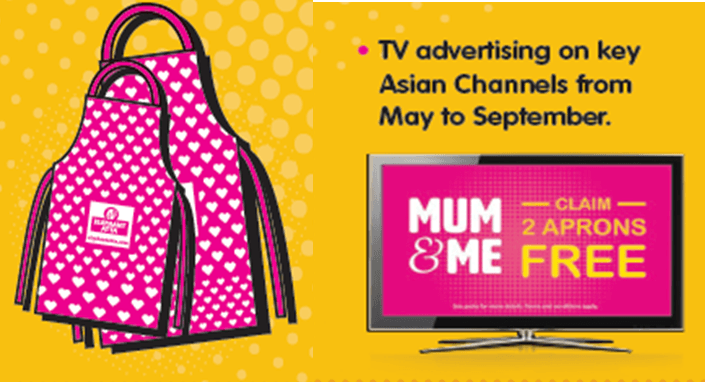 An apron offer for Mum, and one for me! One of Elephant Atta’s greatest strengths is the heritage it shares with Indian families. Our valued position in the hearts and minds of our customers has been hard earned with campaigns celebrating the passing down of traditions, and this year’s Ramadan promotion is no different. Our latest campaign celebrates the special bond between mother and daughter. During May and July of this year, customers will be given the opportunity to collect tokens – one from a 25Kg pack, two from a 10Kg pack – to get two free aprons. ‘One for Mum, one for me’. As an additional reward, we are also offering 50p off to consumers purchasing a 25Kg pack during this period. The promotion will be supported the impactful point of sale and a major TV campaign. You wont be able to miss it!